Exercise is one of the best ways to relieve stress. Yes, it may seem like you are physically stressing your body through jogging or working out but it works wonders in reducing mental stress. If you are stressed after an eventful day, have a run or hit the gym and you will certainly notice the difference in your mood and stress levels. There are also the numerous other health benefits. This is of the probably the simplest and fastest way to relieve stress, especially if you are in a place where physically engaging activities cannot be done, for instance, a lecture. Deep breathing helps focus your mind on the breathing away from the stressful situation thereby lowering your blood pressure and heart rate. You have probably heard the saying “take a deep breath” well the latest studies show that you actually need to take at least 4 deep breaths to change your physiology. After doing this you should feel more relaxed and composed. If you feel overwhelmed by the amount of work you have to get through, list everything in a simple checklist can significantly reduce the pressure felt. You can also allocate a time scale to complete the tasks​ listed. This can be referred back to at anytime and help you feel in control. While making your list, you can also note the things that you have successfully completed. Reason being, if you have a look at what you have done, it can help relieve stress by reminding you that you have completed similar tasks in the past. 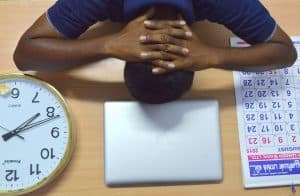 Try not to put things off or let them carry over into the next day If you let tasks outrun their course, stress can continue to rise. It is important to make a point of handling your tasks for the day, that very day in order to begin the next one on a clean slate. A to-do list can help with this. If you’re feeling stressed about something, talk to a friend or family member. A problem shared is a problem halved. Just getting everything off your chest and sharing it with someone can really make a huge difference. Music has been shown in studies to effect physiological functions, slowing the pulse and heart rate, lowering blood pressure and decreasing the levels of stress hormones. Most studies tended to be on the effects of classical music. However, from personal experience I find anything quite chilled or upbeat helps. This may seem like an odd suggestion but it actually works. When you chew gum, it increases the blood flow to the brain while also giving you a sense of well-being. It has also been noted that chewing gum can induce brain waves which are similar to those experienced in a relaxed state. A study by Swinburne University in Melbourne showed that chewing gum reduced the stress hormone cortisol in participants. Adding one or several of the above methods into your day to day activities should help reduce stress and anxiety.